Security guard tracking system software is expected by today’s stakeholders. It is no longer sufficient to ask your clients for their blind trust–that everyone is doing what they are supposed to be doing, when they are supposed to be doing it; not when real-time guard tracking systems are available. And it is not necessarily a matter of your own concern—if you know your officers well, you know that you can trust them—but a stakeholder/ customer does not know you, your security officer business, nor your officers. Your clients need to know that you can track your guard tours and patrols with GPS and that they can see that data in your reports, in order to dispel any concern that they have. Call GuardMetrics for a real-time officer reporting and security guard tracking system app. If your security guard company can deliver a real-time, officer reporting and security guard tracking system to your clients, you are in league with the biggest players in the security guard business, regardless as to whether you have one client or one thousand clients. GuardMetrics is particularly positioned to help small to medium sized guard companies do just that. With GuardMetrics’ pricing model, tailored to your security officer company model, we can make a security guard tracking system cost-effective for you. 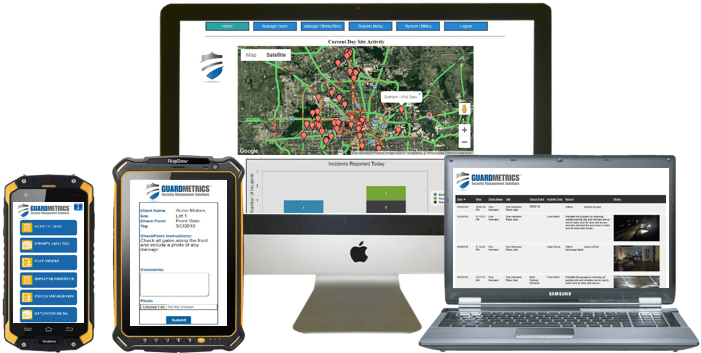 Affordability should never be the primary deciding factor for security guard company software, but if you can have an efficient, easy-to-deploy, real-time mobile guard tracking system app, and it is affordable, then that is the best guard tracking system for you. But we take affordability one step further: GuardMetrics allows for usage on any mobile smart-device—iPhone, Android, Windows-Phone, tablet, laptop, etc. Your officers can even log-in from their personal phones and GuardMetrics will still deliver the same real-time situational awareness, along with time stamps and geo-tags! Call a us for a no-cost demonstration of the GuardMetrics security guard tracking system. Real security is delivered in real-time. Today’s stakeholders demand it and your guard company needs to provide it in order to compete and win more bids. That is the bottom line. Security officer company software MUST include an efficient security guard tracking system. GuardMetrics will deliver that and much more, including; marketing support at no additional cost, branding with your company logo, financial resources, operations services, insurance programs, revenue sharing opportunities, and just about anything you can think of to help you build your security guard company business.